Community Health Educator: Call 410-396-9932 to request a speaker at your community organization or school or to get information about current smoking cessation programs and e-resources. 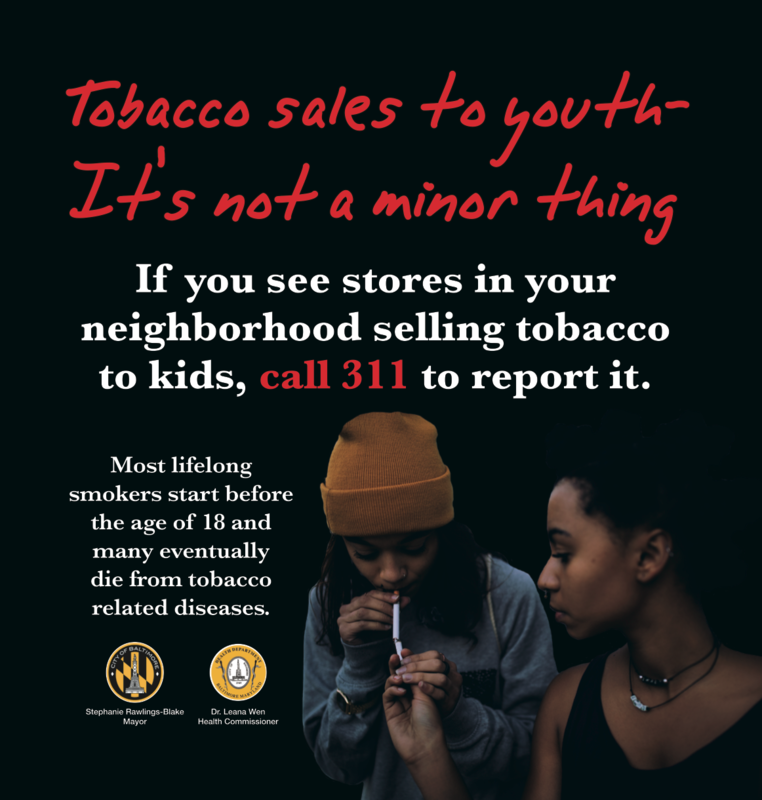 Youth Education: If you are a teacher or work with youth K-12, you can call 410-396-3718 to request our Youth Tobacco Educator to come to your school or group. Youth Resources: Click here for "We Can Beat This Together," a photonovella that highlights the impact of secondhand smoke on children and their families. This project was developed in partnership with fourth grade students at KIPP Harmony Academy and Johns Hopkins SOURCE graduate students at the School of Public Health. Enforcement Officer: Call 311 to report an illegal sale of cigarettes or to request that an officer visit a local retailer to check on sale of tobacco products to minors, or sale of single cigarettes, or placement of tobacco products within reach of young customers. BCHD purchases nicotine replacement patches and distributes them to Federally Qualified Health Centers in Baltimore City. In order to receive a month’s supply of these free-of-charge items, a Baltimore City resident must enroll in a cessation program, also free-of-charge, at one of the health centers. Please call 410-361-9765 to find a health center near your home. 1-800-QUITNOW is a FREE service for Marylanders 13 years and older and sponsored by the Maryland Department of Health and Mental Hygiene. The Quitline can help you quit any kind of tobacco use – cigarettes, cigars or smokeless and you can talk to a live Quit Coach 24 hours a day, seven days a week. Counseling is provided in English, Spanish or other languages. Callers are eligible to receive 12 weeks of FREE nictotine replacement therapy, such as patches and gum. Additionally, there are special incentives for pregnant women who call. You can find out more here.